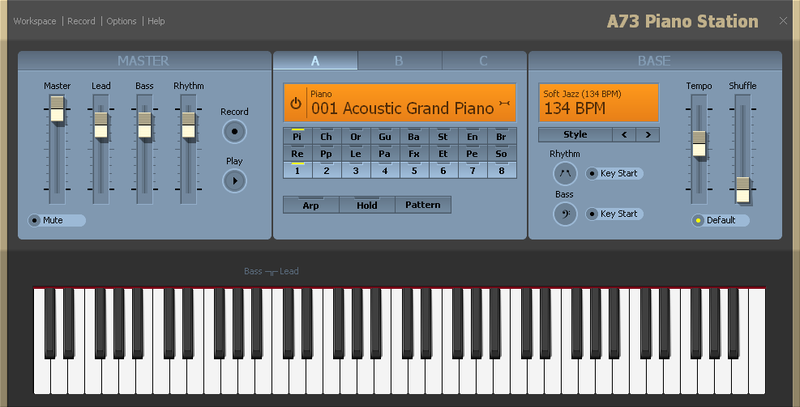 Transform your PC into an advanced, yet easy to play, virtual piano, synthesizer, or even a band. Play piano and over 100 other instruments on your computer using your mouse and computer keyboard, no special hardware is needed. Play your favorite music or enjoy your own creations for a truly different type of relaxation and entertainment. Play at a birthday party, create a Christmas performance, have fun anywhere and anytime when traveling with your laptop. A73 Piano Station is a powerful tool to develop one's musicality and an effective, stimulating extension of piano lessons, yet it is fun like a unique creative game. In addition, due to its simple design, it makes a perfect gift for musical children. Play 128 instruments, from clarinet to electric guitar, from acoustic drums to synthesizer sounds. Combine up to three instruments to create new sound effects. Switch on the drum machine, add bass and chord accompaniment to your melody with just a few clicks. Accompaniment styles range from jazz to dream dance, from waltz to blues. Use arpeggios to play piano chords and various rhythmic patterns in perfect time. Add to that, convenient mixing, tempo, shuffle controls, a metronome, a recording function, and an easy, stylish graphical interface featuring 73 realistic piano keys with dynamic shadows. The program works with any General Midi compatible software and hardware device, including Microsoft GS Wavetable SW Synth available on all XP and Vista computers. VeryPDF PDF to XLS Converter is a good assistant for those who need to convert the PDF to Excel then reedit it. This site does not contain serial number, crack, keygen A73 Piano Station serial number : serial number is the simplest type of crack. A serial number(cdkey,product key,etc) is register the program as you may already know. a crack or keygen may contain harmful software. If you cannot find the exact version you want, just give it a try. for more information read .nfo/.txt/.diz file include in zipped file.